That wonderful "wow," affect from Salt Nic Maui Waui is now available in a frozen blend! Maui Waui On Ice is your choice when it comes to mangoes, pineapples, and juicy, ripe apples with a cold kick! Regular salt version available here! Introducing Smoozie Vapes! Smoozie is a premium, flavorful all day vape that tastes just like your favorite smoothie drinks! Flavor Profile: That wonderful "wow," affect from Salt Nic Maui Waui is now available in a frozen blend! Maui Waui On Ice is your choice when it comes to mangoes, pineapples, and juicy, ripe apples with a cold kick! Regular salt version available here! Warning: Do not use in Sub-Ohm tanks and atomizers. Only use in high resistance, low output devices like pod based devices. Nicotine warning: 50/50 PG/VG Blend, available in 30ml bottles with concentrations of 20mg, 35mg, 50mg salt base nicotine. I personally prefer the Strawberry Gone Wild version but it was really nice trying something new this time. I use this juice in my evolve kit and it has worked perfectly for me. Love that it is not harsh and has a nice menthol taste. 50 / 50 For those who like an intense flavour as well as a throat hit. 20 / 80 Smoother inhale with bigger clouds and a mild flavor. PG stands for Propylene Glycol, a thin, odourless and tasteless liquid used safely for more than 50 years in food. VG stands for Vegetable Glycerin, a natural organic glycerol that is made out of vegetable oil. The VG is a thick, odourless, and sweet-tasting liquid. Apollo e-liquids are guaranteed contaminate free. All flavors are made with: USP Grade PG and VG, Food Safe Ingredients, Laboratory Grade Nicotine. 0mg (0%) Just for flavor. No nicotine content. 6mg (0.6%) For light smokers who still want to feel a little nicotine. Where does Apollo deliver orders? Apollo is well known for great product selection, and also for the quick dispatch of orders. Most orders are shipped the next business day, and we deliver to the USA, and Worldwide (Apollo will not be held responsible for any customs issues, if they occur). If you have any questions on shipping, please contact our Customer Service Team. Free shipping is available to customers with a USA shipping address on orders over $50. Simply select the Free Shipping method during checkout. Orders are usually shipped within 1-2 business days, and delivery depends on the shipping method you select at checkout. What payment methods are avaiable? Currently you can check out using PayPal. You do not need to have a PayPal account to checkout, you can simply pay with a debit/credit card as well. The status of your order can be seen in your account. Please keep in mind you need to log in every time you place a new order and to check the status of your orders. You will also receive email notifications when your order is processing and complete – meaning it was shipped. When your order status is pending, this means we did not receive payment from you, and the order is incomplete and will not ship. If you still want to move forward with this order you need to reorder it and complete the payment process. The short way of doing this is to go to ‘My account’, find the order order and hit ‘reorder’. If your order status is processing, this means our team is processing the order and it will be shipped soon. We run promotions typically 1-2 times a month. The best way to stay up to date is to sign up for our mailing list! You can do that at the bottom of each page on the website! What are the ingredients in Apollo’s e-liquids? Why does my e-liquid change color over time? E-liquid can change color, sometimes even before you open it, as a result of oxidation (common chemical reaction). E-liquids containing nicotine may change their color when they are exposed to air, light or heat, and sometimes even when they are kept in cool, dark places. If your e-liquid turns darker inside a clearomiser/tank and you get a slightly burnt taste, it’s time to replace your coil with a new one, throw the burnt tasting e-liquid out, and wash your tank under warm water (let it dry completely before vaping again). The first thing you have to check on both desired vape components is the threading. Threading available on the market fits 2 main categories – 510 and eGo, but most of them come with adaptors so you can easily switch from one to another. Secondly you should always verify the resistance of your coils is compatible with the battery you are using, so that you don't overload your battery. If you have any questions or concerns about this, please speak with our Customer Service Team. Coil (atomizer head) resistance is measured in ohms and comes in over 1.0 ohm and under 1.0 ohm resistance for sub-ohm tanks. The lower the resistance of the coil, the bigger the generated wattage, meaning your coil will get hotter and generate considerably more vapor. If you are using a sub-ohm resistance coil, always make sure the battery you are using can handle the lower resistance. What is a coil’s lifespan? The lifespan of a coil head greatly depends on usage, the e-liquid, and the style of vaping. It can be anywhere from a couple days to a few weeks. When should I replace my coil? Coil heads need to be replaced when you start to get a burnt taste and your tank produces less vapor. This usually happens right after you have changed the coil or refilled your clearomiser/tank. You have to check that your coil is in a good working condition (if not, replace it with a new one), that the coil head is tightly screwed in (finger tight is enough), and that your tank is correctly reassembled. If you are still having trouble, please contact our Customer Service Team. Leaking can be caused by many factors and can typically be resolved quickly. Please contact our Customer Support Team for assistance. How long will a battery last between charges? It is important to know how long your batterywill last between charges. You should pay attention to the battery capacity which is listed in mAh (milliampere-hour). The higher the mAh rating is, the longer the battery will last. Roughly, we can say that 100 mAh equals 1 hour of usage. The pass-through feature means you can use your battery even while it’s charging. Basically, voltage is the amount of energy in a device and wattage is the amount of work that is done in a unit of time. When you are using a device with VV settings, you are telling it to send a certain amount of energy through the circuit. When it comes to VW settings, you are telling your device how much work to do, and the vaping device figures out the voltage needed to overcome the resistance (based on coil head). The most advanced batteries (usually known as mods) are more powerful and feature wattage and/or temperature control for an enhanced, fulfilling, and customizable vaping experience. There are a wide variety of coils tand tanks they are compatible with, and you can adjust their settings until your reach the kind of flavor, throat hit and the vapor production you are aiming for. The 18650 battery is a versatile rechargeable accumulator meant for internal use, being the vape industry's battery of choice for most of the box mods on the market. 18650 batteries have a great lifespan and a wide power output. Apollo sells only the best authentic brands available. Please note: 18650 batteries require an external charging unit. PLEASE NOTE: As of November 22, 2015 our Warranty Policy has changed. All purchases made on or after this date are subject to the revised Warranty Policy outlined below. If you have any questions please contact our Support Team at support@apolloecigs.com. Warranty Replacements can only be honored by our Support Team if the product was purchased from us via this website, and you can supply your order information. 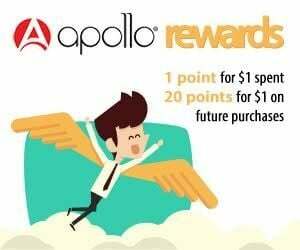 If you purchased your Apollo product from one of our authorized retailers you must redeem your Warranty through that retailer. Apollo offers a Six (6) Month Limited Warranty on all Apollo branded electronic components (including batteries, chargers, and mods). This warranty does not apply to 3rd party products not made by or branded with the Apollo logo. For a period of Six (6) Months we guarantee that your Apollo product will be free from defects in material workmanship under normal use and service for the product’s lifecycle, according to product usage documentation. This warranty does not cover any defects or damages on products that have been lost, misused, improperly or inadequately maintained, or modified. The warranty lasts for a period of Six (6) Months from the date of purchase, however products are limited to a maximum of five (5) replacements on any given item. The item must be ruled defective by our Support Team and will be replaced with an equal item from current inventory. Replacement or upgrade of product is your exclusive remedy under this warranty. Apollo offers a Thirty (30) Day Limited Warranty on all 3rd party electronic components (including batteries, chargers, and mods). This Warranty applies to products not manufactured or branded by Apollo. For a period of thirty (30) days we guarantee that 3rd party products purchased from Apollo will be free from defects in material workmanship under normal use and service for the product’s lifecycle, according to product usage documentation. This warranty does not cover any defects or damages on products that have been lost, misused, improperly or inadequately maintained, or modified. The warranty lasts for a period of thirty (30) days from the date of purchase, however products are limited to a maximum of two (2) replacements on any given item. The item must be ruled defective by our Support Team and will be replaced with an equal item from current inventory. Replacement or upgrade of product is your exclusive remedy under this warranty. 3rd party products typically include a manufacturer’s warranty, in which case you must directly contact the manufacturer of the product for warranty replacements. Apollo offers a Fourteen (14) Day Limited Warranty on all clearomizers, tanks, cartridges, replacement coils and cartomizers. This warranty does not cover any defects or damages on products that have been lost, misused, improperly or inadequately maintained, or modified. Using e-liquid that is highly acidic or contains cinnamon will void this warranty. Clearomizers, coils, cartridges and cartomizers are intended to eventually burn out and be replaced, and there is no perfect measurement scale for how long they will last due to a variety of factors. Everyone uses these products differently, and we cannot control for all variables. Recent industry quality studies have shown that if an atomizer works properly the first time it’s used, there is little reason other than improper use for it to stop working properly. We cannot warranty these products for a period of more than fourteen (14) days, because many of them only have a lifespan of fourteen (14) days. All sales of e-liquids, disposables, and Rebuildable Drip Atomizers (RDAs) are final. Apollo does not accept returns or exchanges of these products and does not offer a warranty for them. All warranty exchanges require preauthorization and must be accompanied by a completed Return Merchandise Authorization Form (RMA). To obtain authorization and an RMA Form, please contact customer service via online chat, or email support ( support@apolloecigs.com), or call customer service at 855-2-APOLLO (855-227-6556). Apollo reserves the right to revise or modify the terms of this warranty agreement at any time for any reason without prior notification. We manufacture our liquids so everything is in stock. All the time! Find a store near you that sells Apollo E-Liquids. Free US shipping on orders over $50 or $150 International. 100% refund if you change your mind or you have a problem. Chat, call or e-mail our support team for help.